Group photo of participants, organizers, and US government officials at the welcoming lunch conference, in Washington, DC, August, 2011. Thy Heang, who grew up in Phnom Penh, is currently a communications officer at Cambodians for Resource Revenue Transparency, which monitors the country’s oil and gas industry. She has a master’s in journalism from Hong Kong Baptist University and is currently on a four-month fellowship for the Community Solutions Program, which is sponsored by the leadership nonprofit IREX. In the program Thy Heang and 66 others, including another Cambodian, will learn more about transparency and accountability, environmental issues, conflict resolution and women’s issues. 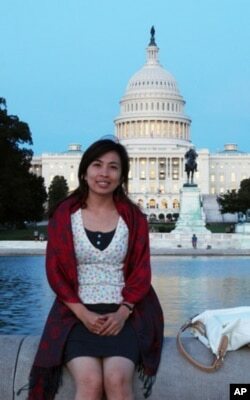 Thy Heang, is currently a communications officer at Cambodians for Resource Revenue Transparency. Meanwhile, she said, advocacy work in Cambodia’s oil, gas and mining industries remains weak, due to a lack of resources and knowledge and difficulty accessing information, as well as sites. Thy Heang said she hopes the Cambodian government will actively promote better transparency and involve civil society in oil, gas and mining, to increase the benefits to the public.